This 1976 album is undoubtedly one of the greatest classics of Brazilian popular music, with Jorge Ben mixing funky samba, Afro-Brazilian beats, and crunching guitars to create one of the most fascinating sounds ever recorded in Brazil. The album kicks off with the raw, energetic "Ponta de Lança Africano," and from there on it never slows down, but continues to pile up one fiery, funky gem after the other. The samba soul and samba funk scenes of the '70s in Brazil produced many great artists and many great recordings, fully comparable with the best soul and funk music recorded in the U.S. during the same period. Jorge Ben was the most prominent figure of this scene and "África Brasil" is probably the most famous of his '70s recordings. 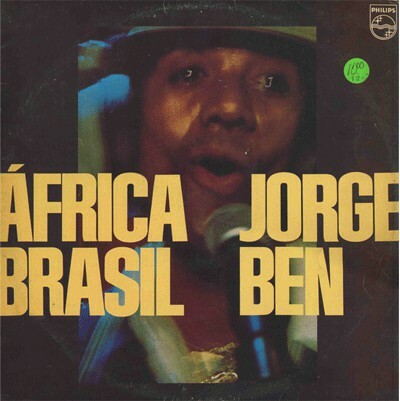 For any person who is interested in the music of Jorge Ben, or indeed Brazilian funk in general, there is no better sample of it than "África Brasil".